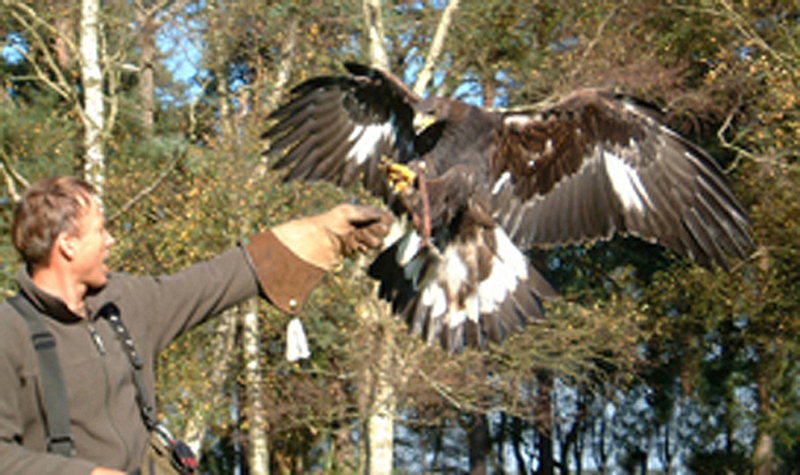 The adventure begins with a welcome to the site and an introduction to the birds we have at Forest Falconry. Then it's on with a Gauntlet and straight out into the woodland with a Barn or Tawny Owl for some flying to your fist from the silent flyers. With nearly a Hundred birds on site there is always something that needs training so you will assist the Falconer with either an Owl or Hawks early stage flying lessons.We stop for Refreshments about 11 am (Hot and Cold drinks are provided). You will experience the thrill of taking a Harris Hawk on a walk along the woodland paths, watching it follow from tree to tree then swooping in to land on your Gloved hand. We like to finish the morning with a flight from one of the Worlds largest Owls, the European Eagle Owl, with a wingspan of over 4 feet its sure to get the pulse racing! We say goodbye to the half Day Guests at 1 pm then after the dinner break you get to assist in the training of a Falcon. These are the speed merchants with some Falcons able to reach speeds of 200 mph. The rest of the Full day adventure is for the strong armed, as you will fly the Worlds biggest Owl, the Siberian Eagle Owl and the awesome Golden Eagle with its incredible wingspan of over 7 feet. We hope this will be a day never to be forgotten, and will only fuel your interest further of these incredible creatures. Gates are opened at 09.30 am, so please aim to arrive here between 09.30 and 09.45 am. However, please telephone 01794 323310 on the morning of your booked event before leaving home, if you have any doubts regarding the weather - to check whether the activity will still go ahead. Wear suitable outdoor clothing and closed footwear and don't forget your Camera! Refreshments, hot and cold will be provided, but Full day participants will need to bring their own lunch and are welcome to use our on-site Fridge, Microwave, Cutlery and Crockery. PLEASE NOTE; No children under the age of 13 allowed on site and strictly NO DOGS! Gift Vouchers are valid for one year from date of purchase. You may bring a Spectator (Restricted to One per participant), at a further charge of £25 - this can be added at the time of booking your day and paid for on arrival. Unfortunately, you cannot add a Spectator to the Gift Voucher. Your Spectator will be with you at all times (not watching from a distance!) and they may take as many Photos as they wish.